Darat Al Tasweer announces the 8th edition of the Image Festival Amman, under the theme “Wandering ترحال” that will take place from the 1st until the 30th of April 2019, supported by the Abdul Hameed Shoman Foundation, as main sponsor for this year. The opening event of the Image Festival Amman on April 1st will be at the Jordan National Gallery of Fine Arts featuring the work of the renowned photographer Josef Koudelka, including his photoessay “Gypsies” in partnership with Magnum Photos. With the presence of the photographer and a representative from Magnum Photos, it will be the first exhibition from Magnum presented in Amman. Along with Josef Koudelka, the Image Festival Amman will feature the Italian legend photographer Mimmo Jodice, in partnership with the Italian Embassy in Amman, as well as National Geographic's and VII agency's photographer Ed Kashi, along with over 20 photographers, and in partnership with over 15 venues in Amman, and additional exhibitions in Salt, Madaba and Irbid. Venues include: Jacaranda Images, NOFA, MMAG Foundation, Nabad Art Gallery, Dar Al-Anda Art Gallery, Tajalla, Fann wa Chai, FADA 317, German Jordanian University, Artisana Jordan, Al Mamar, Haya Cultural Center, Società Dante Alighieri, Duke's Design Center, Sama VA, Methrah for Arts and Culture. Born in 1979, in Amman – Jordan, Linda was fascinated by photography as a child and began taking pictures at the age of 13 when she was given her first 110mm compact camera. In 1998 Linda took her first course in black and white photography followed by special studies in 2002 at The Saint Spirit University / Keslik, in Lebanon. In 2007, with her accumulated experience, Linda established Darat Al Tasweer photography center. Linda Al Khoury has been teaching photography since 2005, she works as a professional photographer specialized in architecture. She dedicates time for her passion to the art of documentary photography and she is working on her long term project "Stories from the Mountains of Amman". The first phase along with other projects, such as "Stories from Jabal Al Lweibdeh", were exhibited in different places around the world. 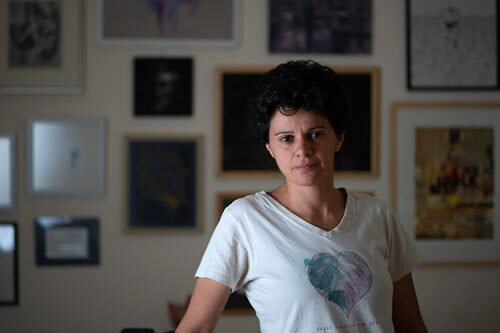 In 2013, Linda established Fann Wa Chai Art Gallery & Tea Bar, a cultural space in Amman that aims at engaging the general public with arts and culture.